Take fly lines for example. Some companies have so many specialized lines they would have you think you need an app to pick one. We think that’s a bit over the top. So here at ARC Fishing, we obsess about line design and technology, so you don’t have to. 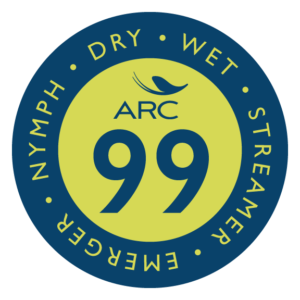 And that’s the significance of the 99 designation on selected ARC fly lines. These lines are good for 99% of the fishing situations you could possibly encounter. All ARC 99 branded fly lines feature time-tested tapers and materials that won’t let you down under the most demanding fresh and saltwater fishing conditions. You can trust them to get the job done no matter where your fishing adventures take you. There may be a few times – say when you are tossing dry flies to wary trout or powering through stiff winds stalking bones on the flats — where you might need a customized taper design. We’ve got you covered there, too, with lines like the ARC Dry Fly, the ARC Bonefish/Redfish and the ARC Tarpon. So forget the fly line selection app and make your next purchase an ARC 99 or ARC specialized fly line … with the confidence that you have chosen a line that’s easy to understand and even easier to use.